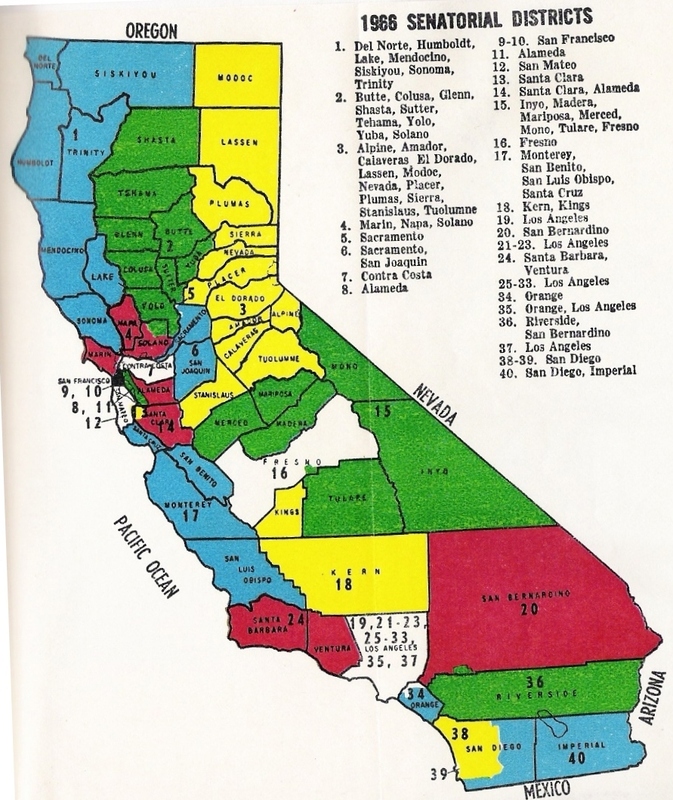 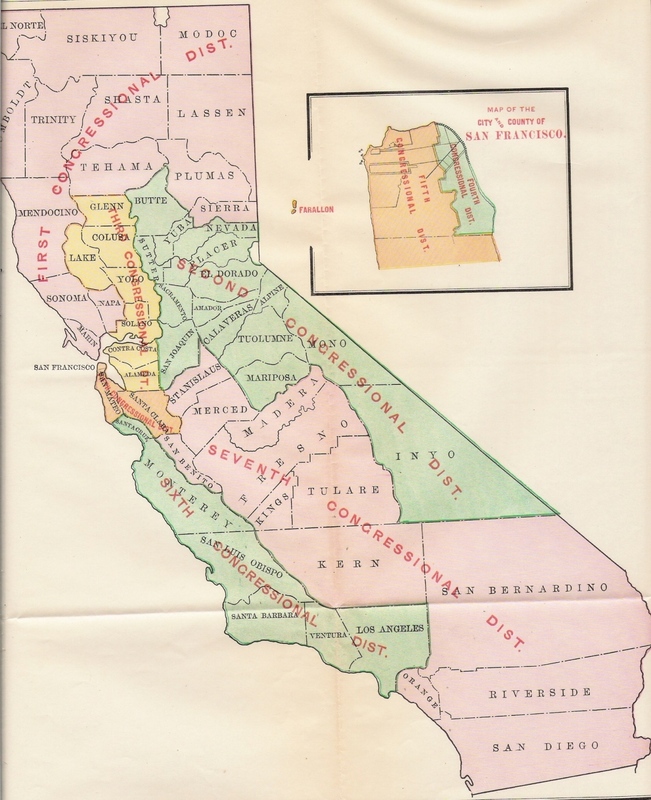 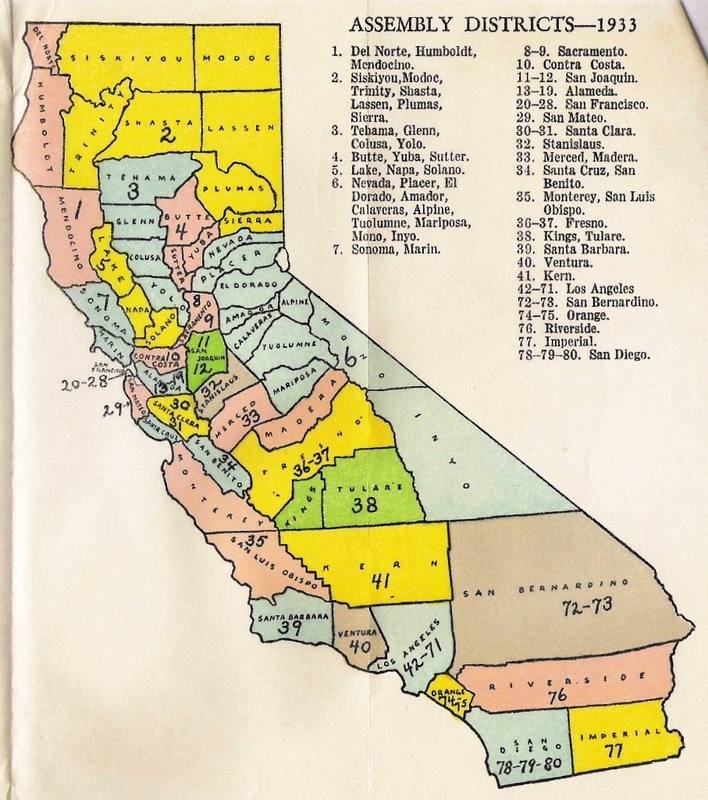 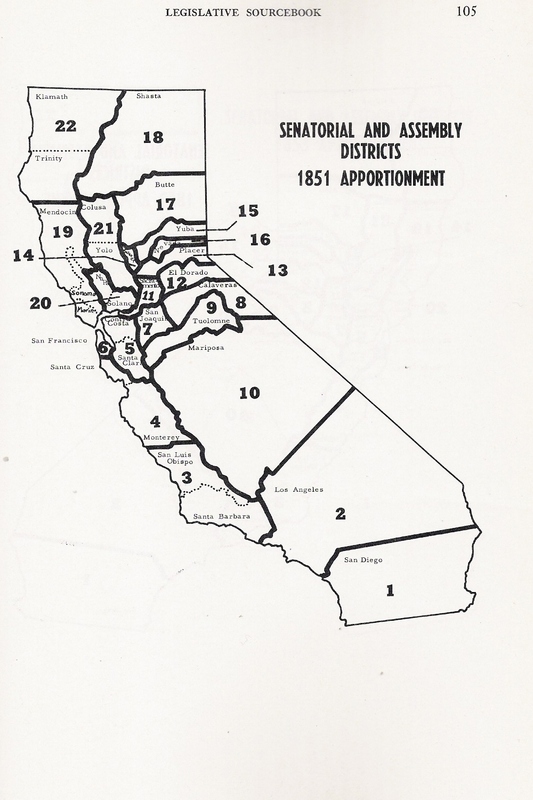 Images of Legislative District Maps, scanned from the "California Legislature" Handbook (1925, 1939, 1947, 1961, 1972, and 1978 editions), compiled by the California Secretary of State. 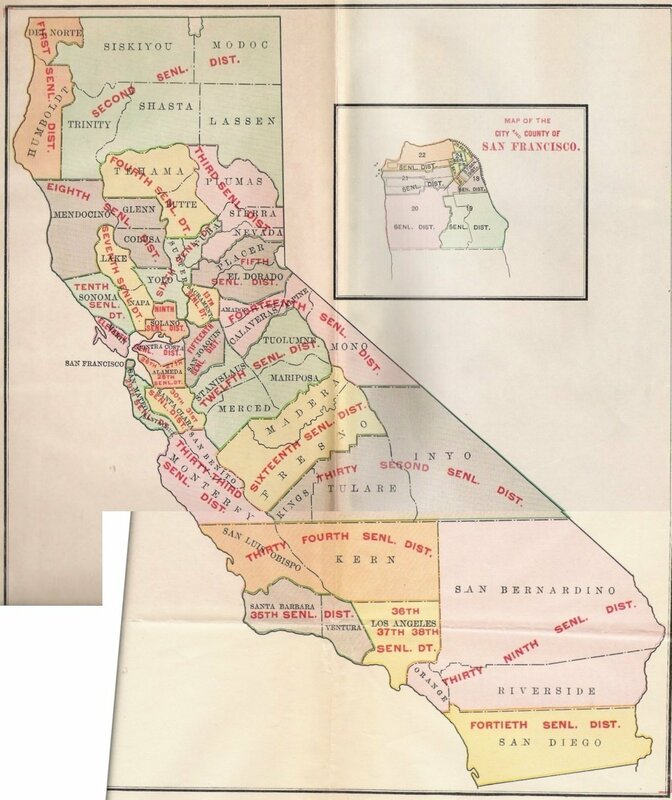 Additional images from the UC Berkeley, California Voter Foundation, and State Senate websites. 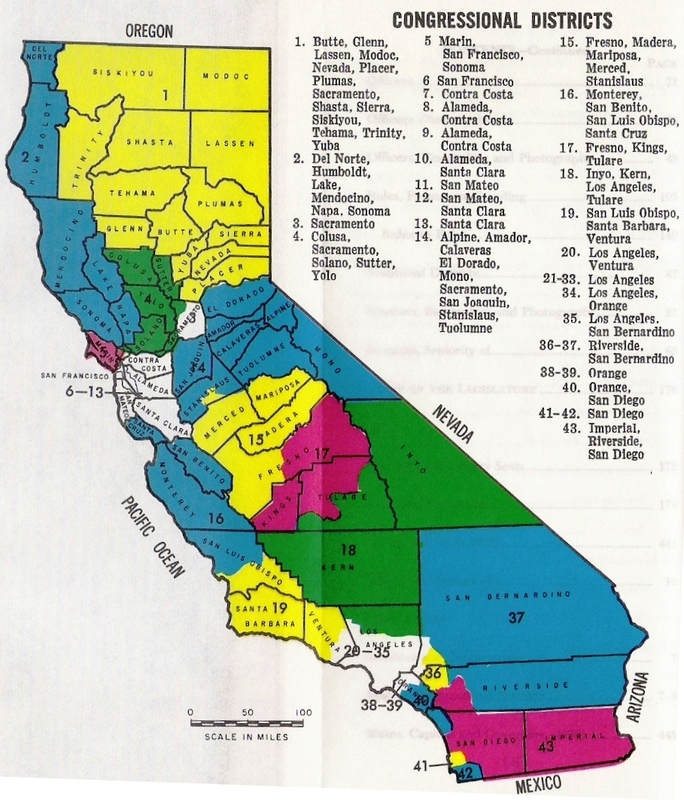 The 2021 redistricting process will begin following the completion of the 2020 Census, which will be conducted in 346 days. 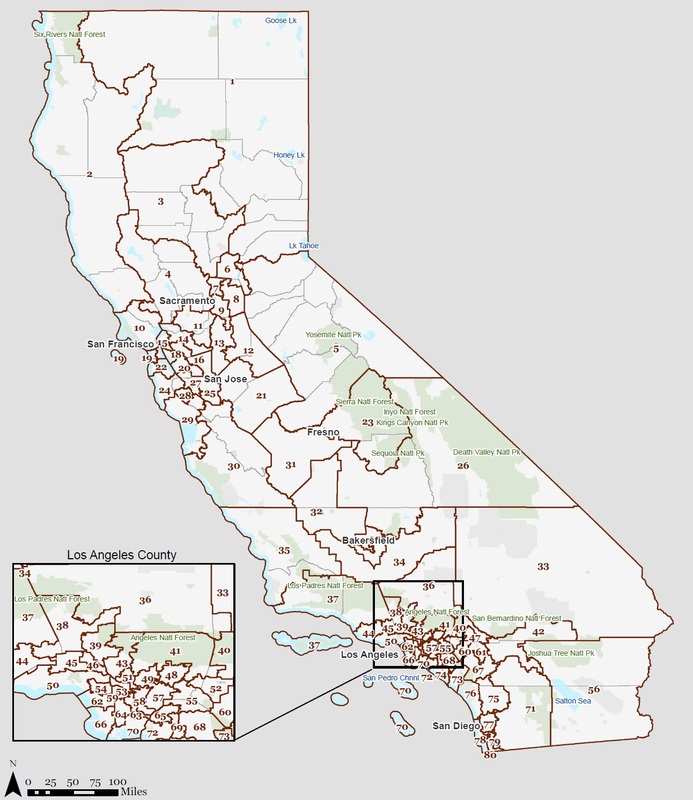 The 2011 redistricting process was guided by the Citizens Redistricting Commission, created by Proposition 11 (2008) and expanded to include Congressional districts by Proposition 20 (2010). 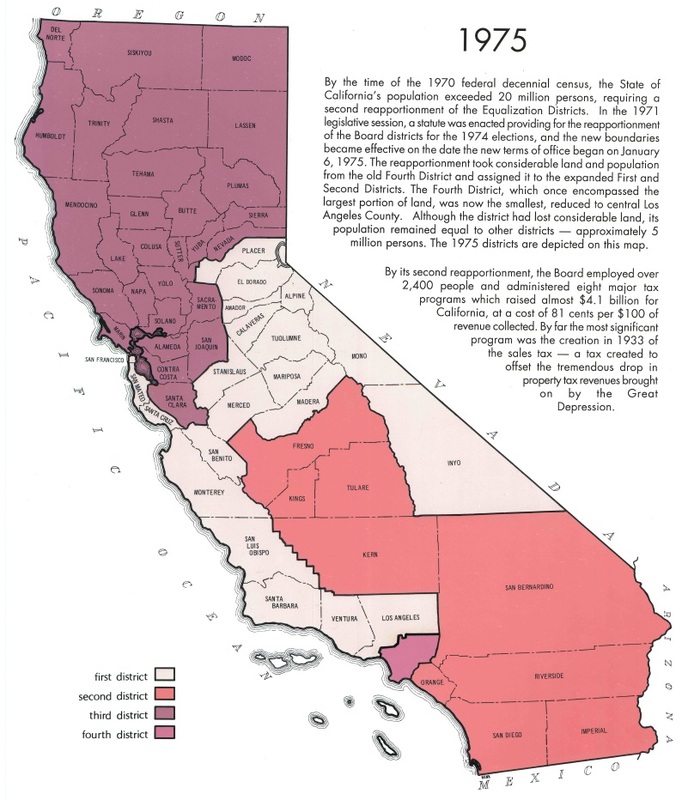 Source: California State Assembly and California State Senate websites. 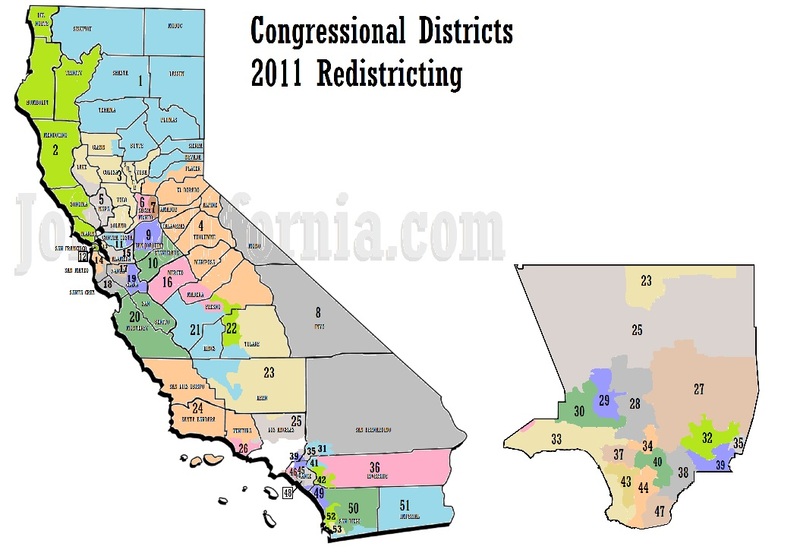 Note: The 2000 Reapportionment expanded the number of Congressional Districts from 52 to 53. 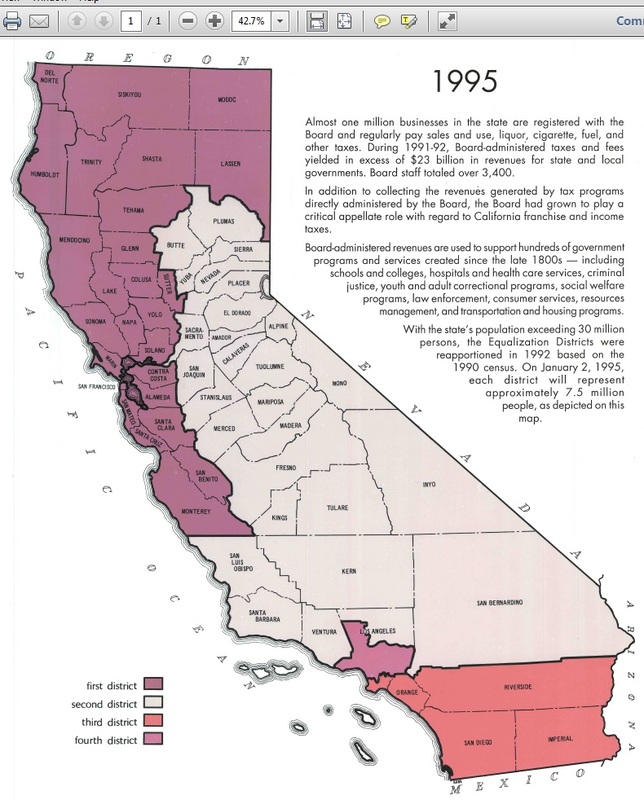 Source: The California Voter Foundation. 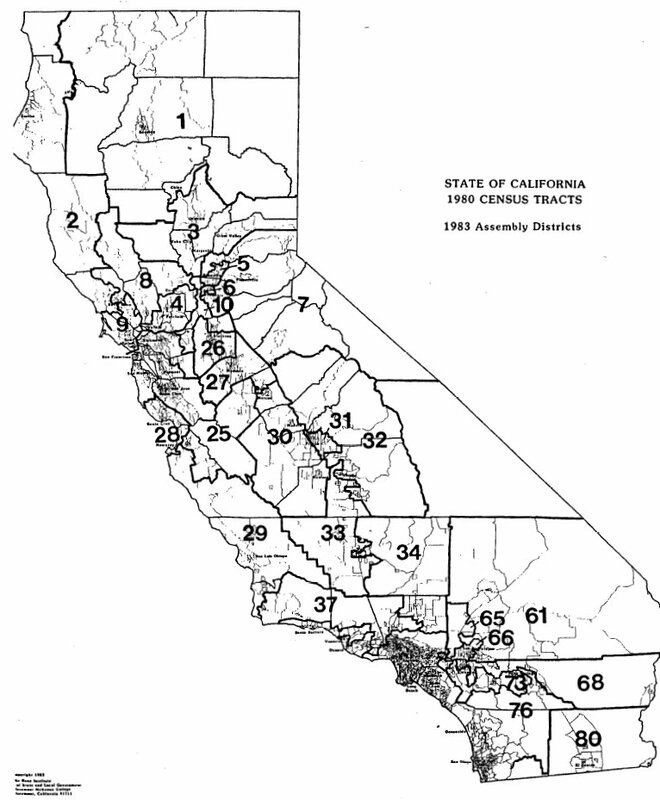 Note: The 1990 Reapportionment expanded the number of Congressional Districts from 45 to 52. 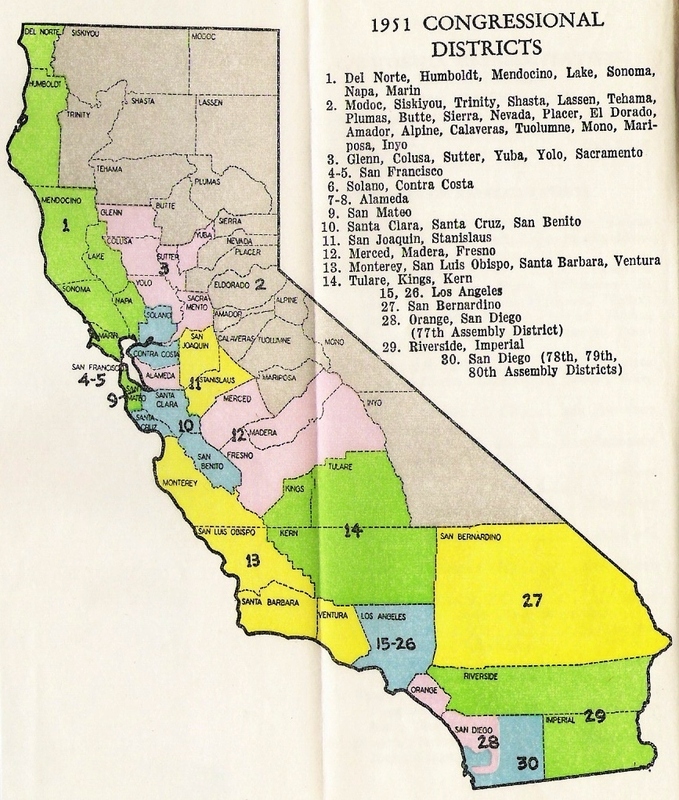 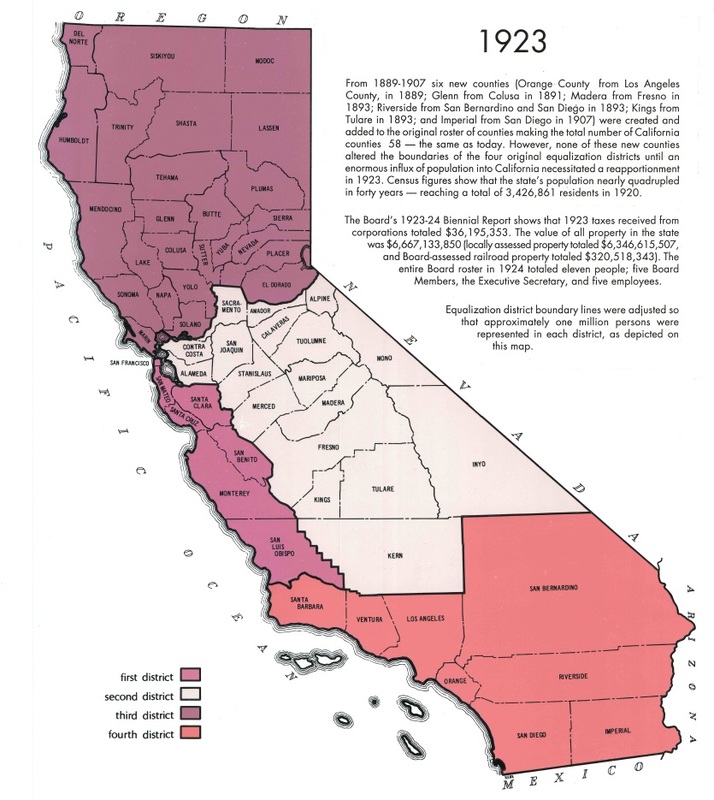 Source: UC Berkeley IGS: California Redistricting Resources. 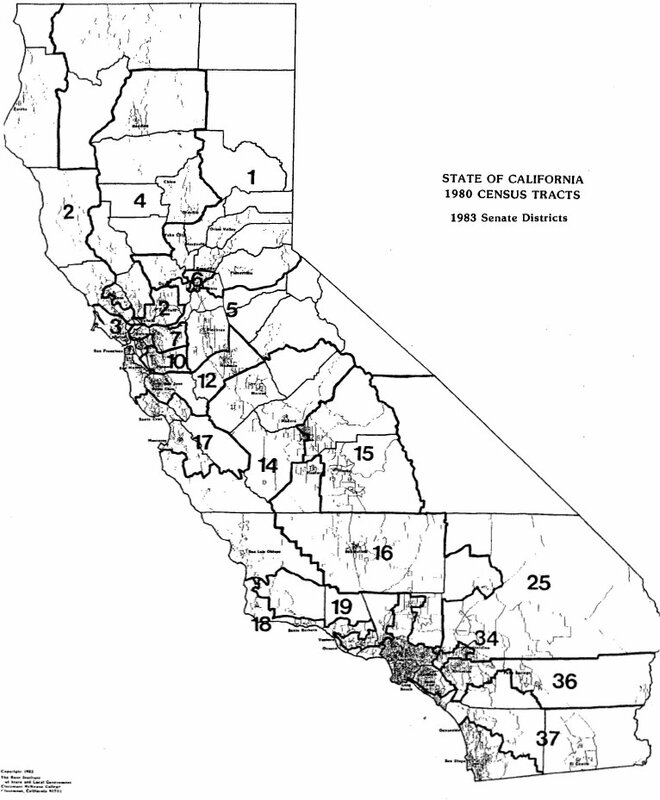 Note: The 1980 Reapportionment expanded the number of Congressional Districts from 43 to 45. 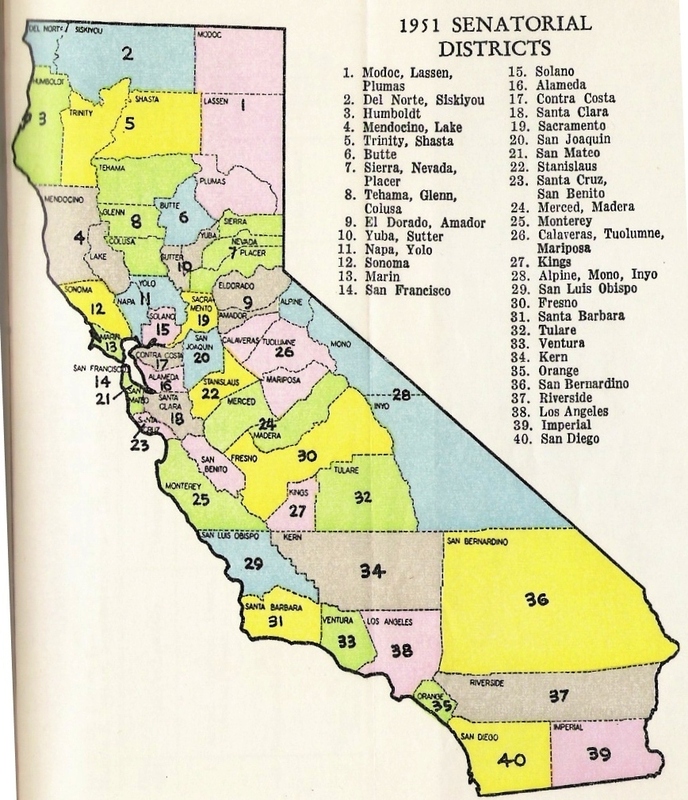 Source: California Legislature at Sacramento" Handbook, 1978. 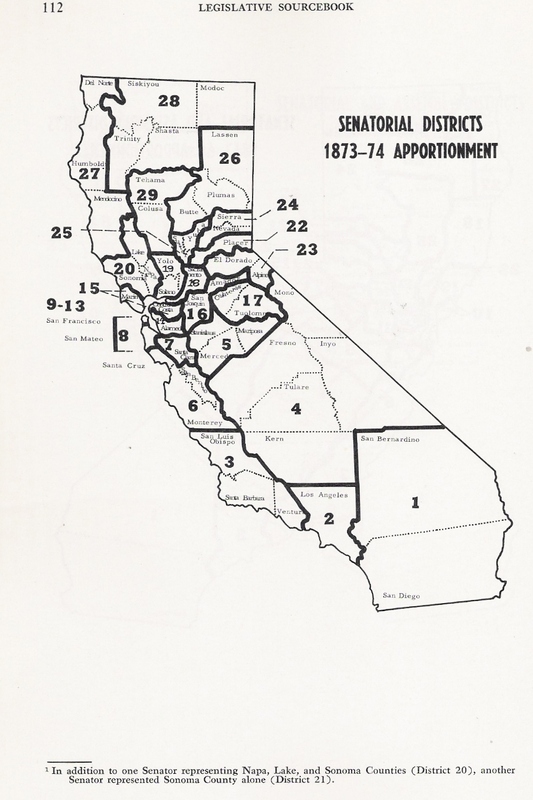 The 1970 Reapportionment expanded the number of Congressional Districts from 38 to 43. 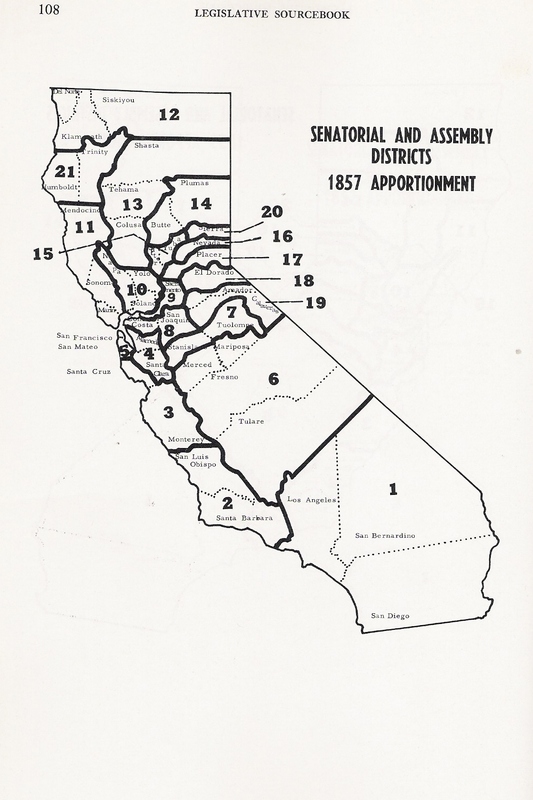 Source: California Legislature at Sacramento" Handbook, 1972. 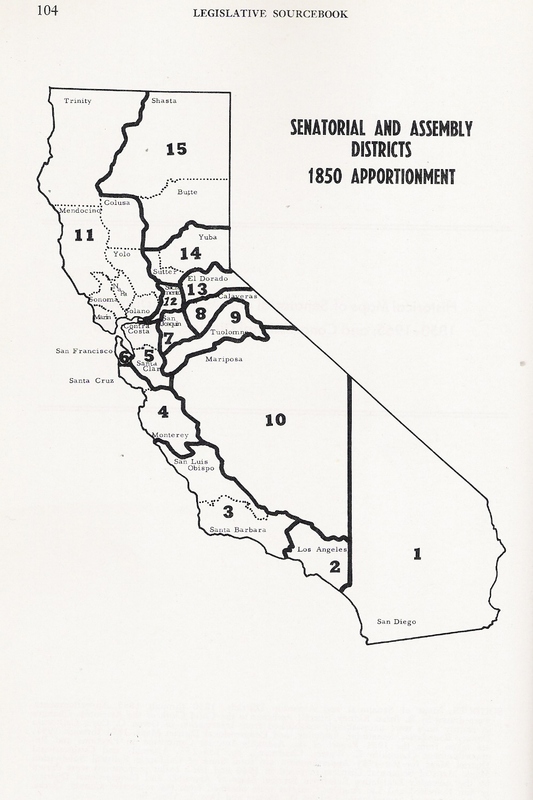 The 1966 Redistricting was mandated by the Reynolds v. Sims court decision, which established the "one man, one vote" principle in legislative districts at all levels. 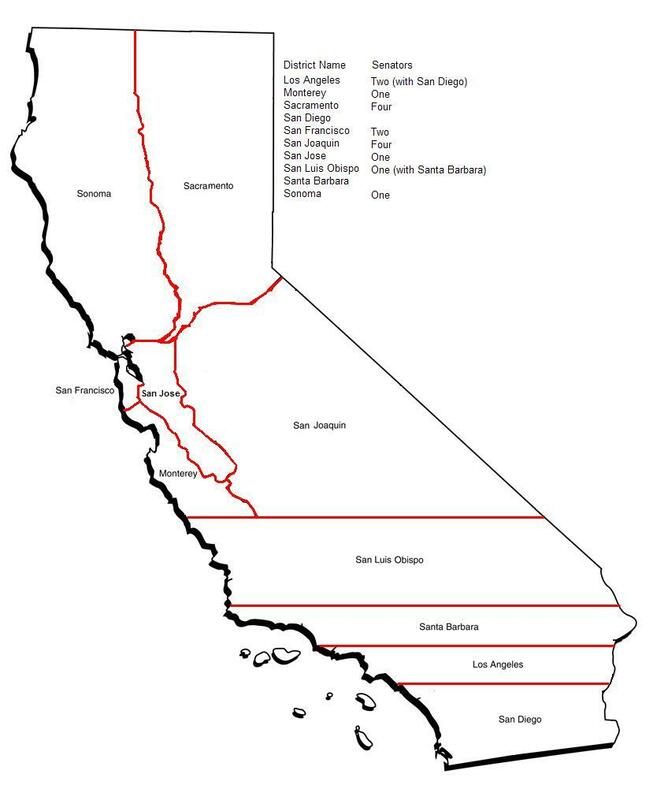 Source: Currently Searching for a source. 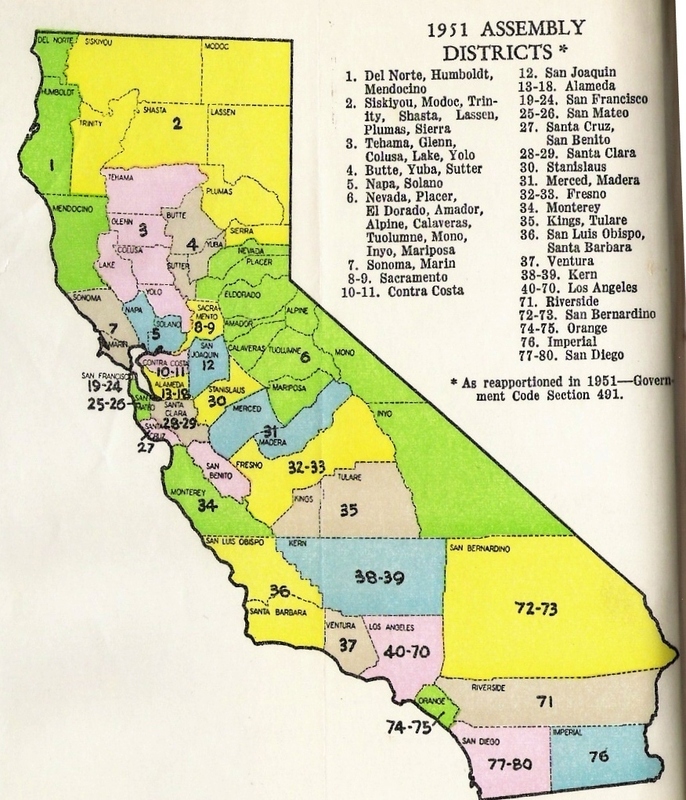 Note: The 1960 Reapportionment expanded the number of Congressional Districts from 30 to 38. 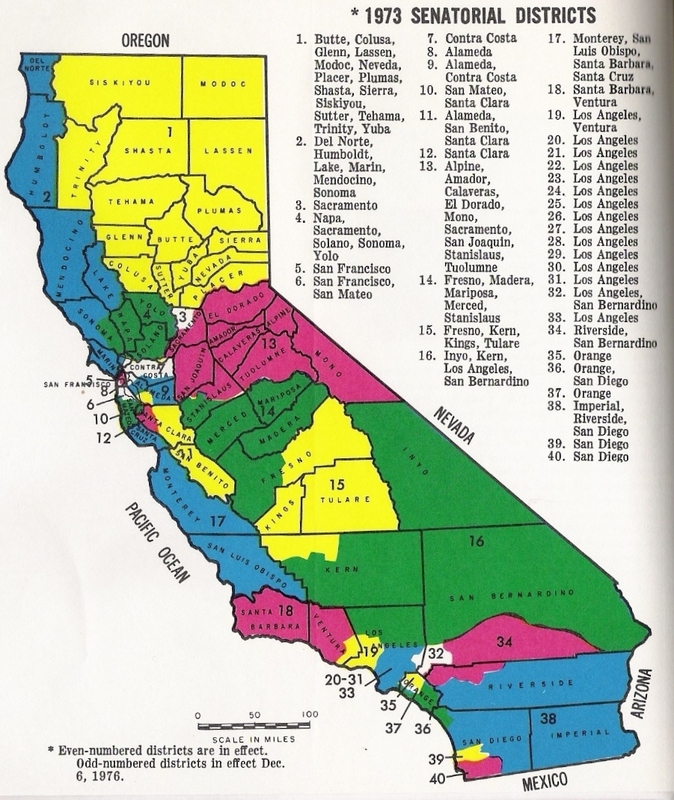 Source: California Legislature at Sacramento" Handbook, 1961. 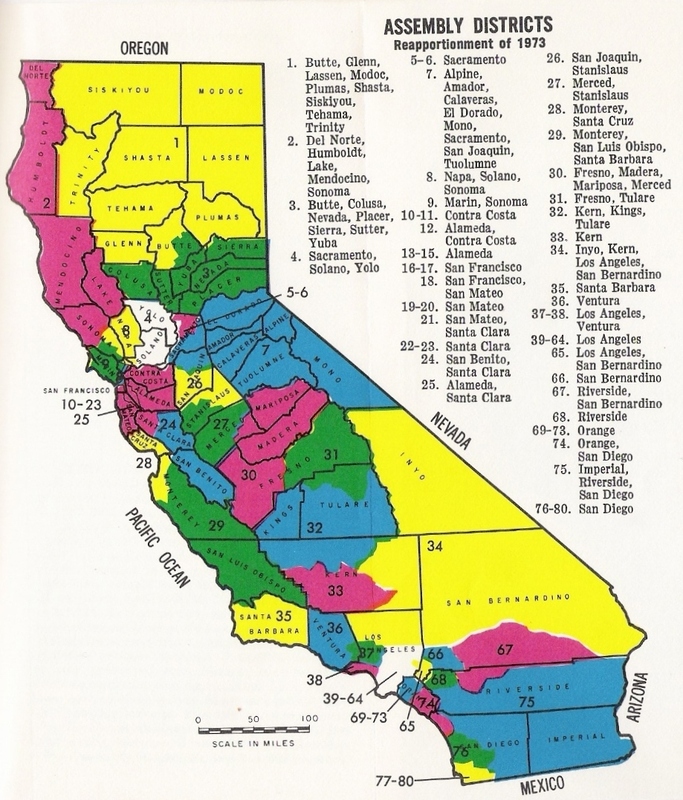 Note: The 1950 Reapportionment expanded the number of Congressional Districts from 23 to 30. 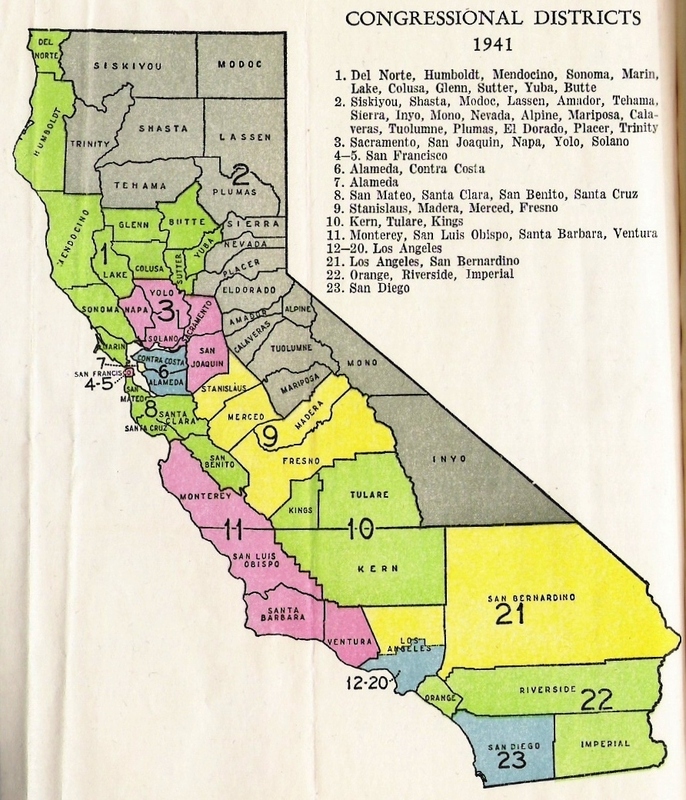 Source: California Legislature at Sacramento" Handbook, 1947. 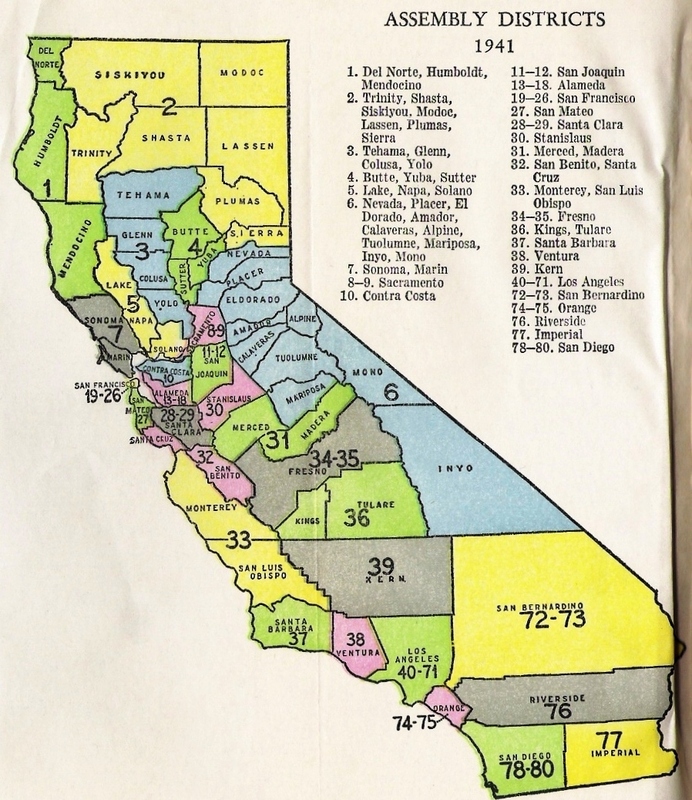 Note: The 1940 Reapportionment expanded the number of Congressional Districts from 20 to 23. 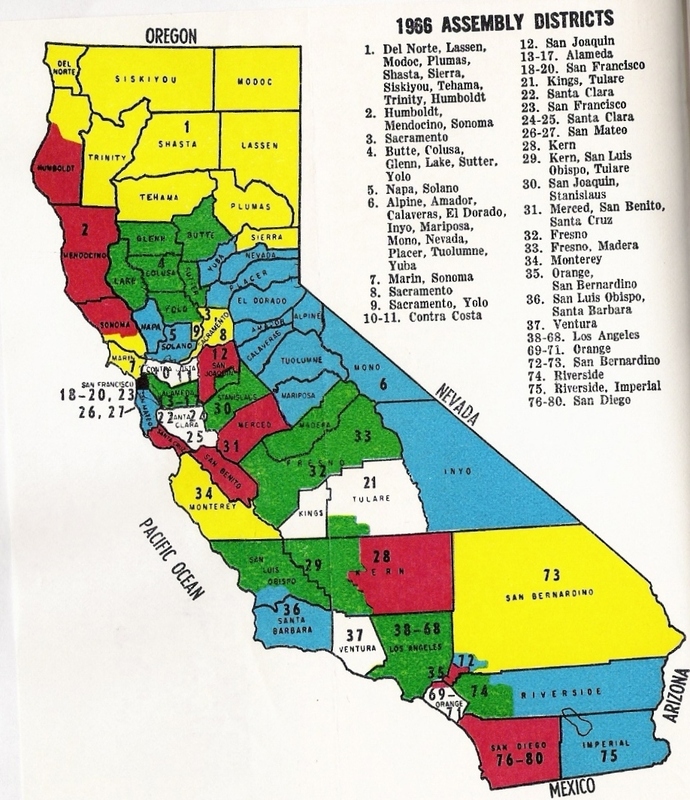 Source: California Legislature at Sacramento" Handbook, 1939. 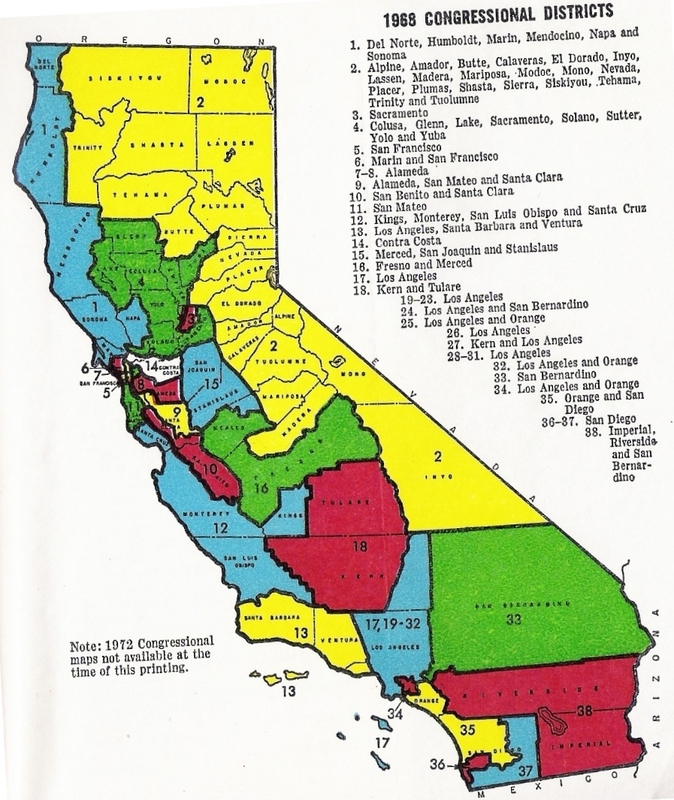 Note: The 1930 Reapportionment expanded the number of Congressional Districts from 11 to 20. 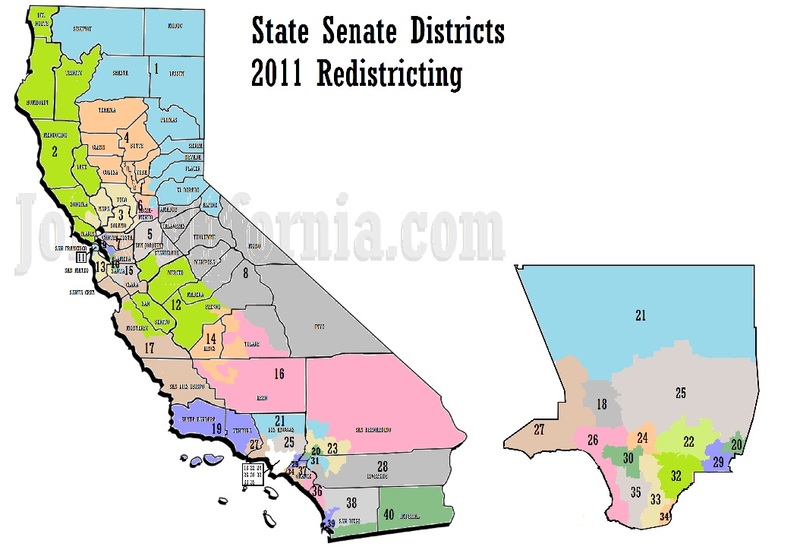 Note: Only the Assembly and State Senate Districts were redrawn. 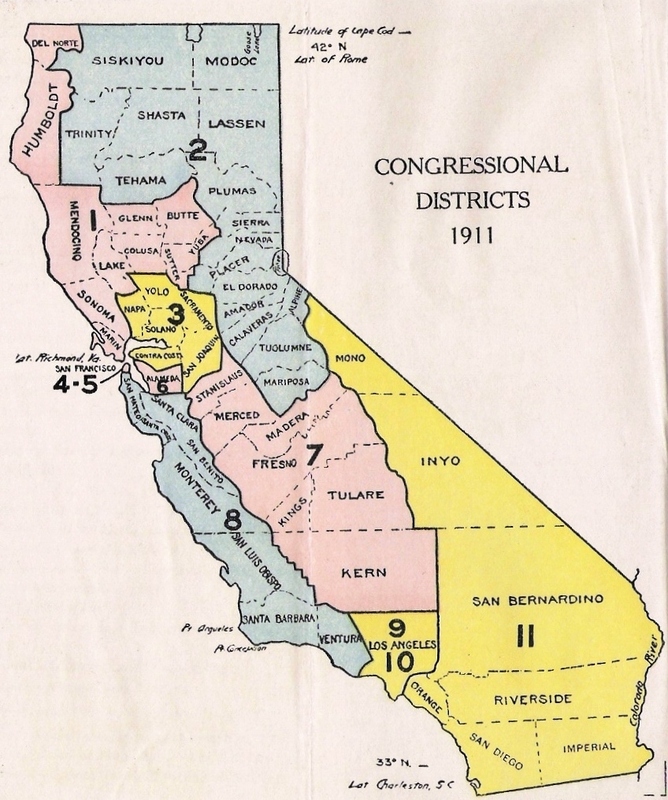 Although these districts were drawn in 1927, they were in effect from 1930 to 1932. 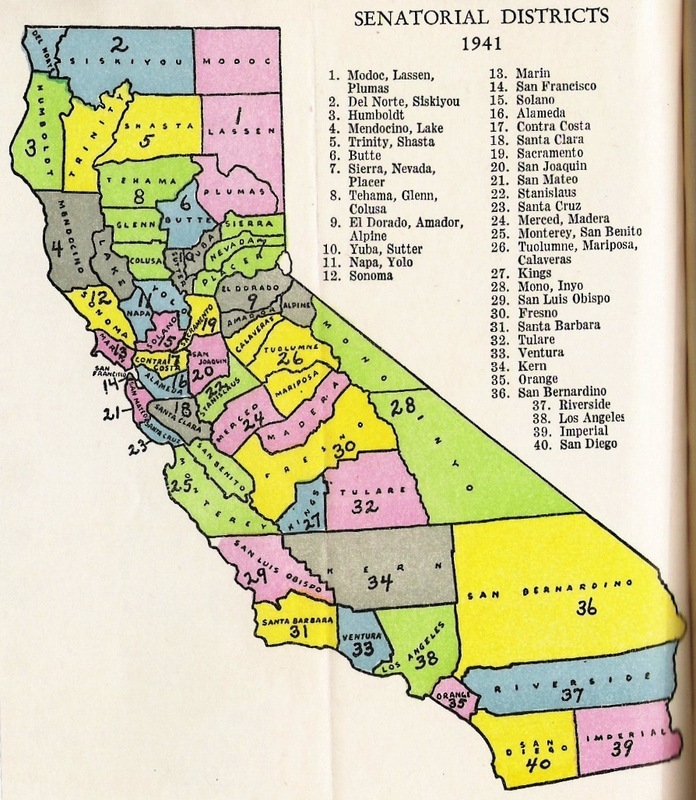 Source: California Legislature at Sacramento" Handbook, 1925. 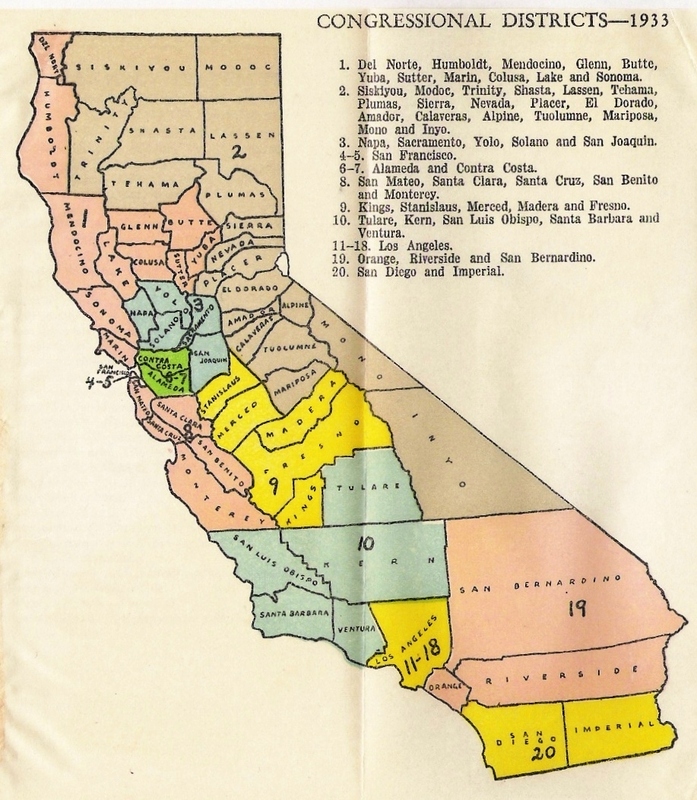 Source: California Legislature at Sacramento" Handbook, 1907. 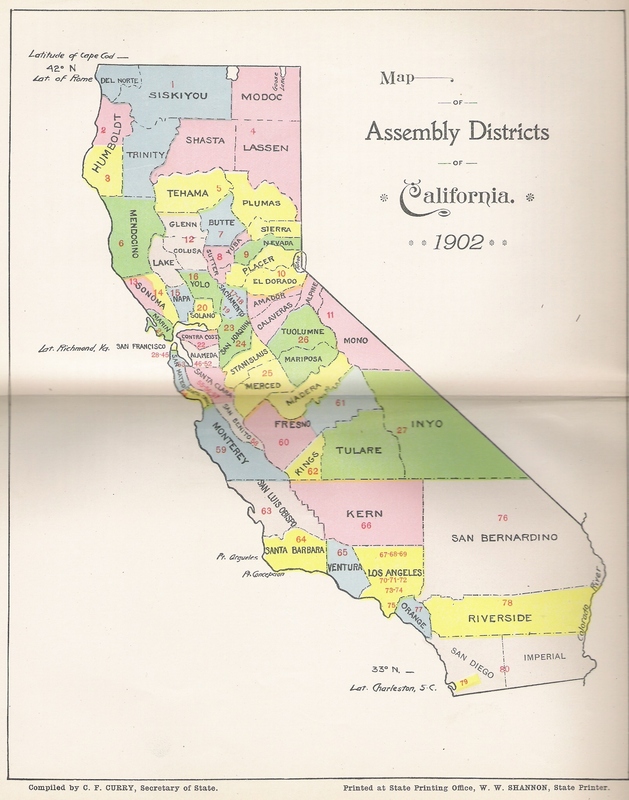 Source: California Legislature at Sacramento" Handbook, 1899. 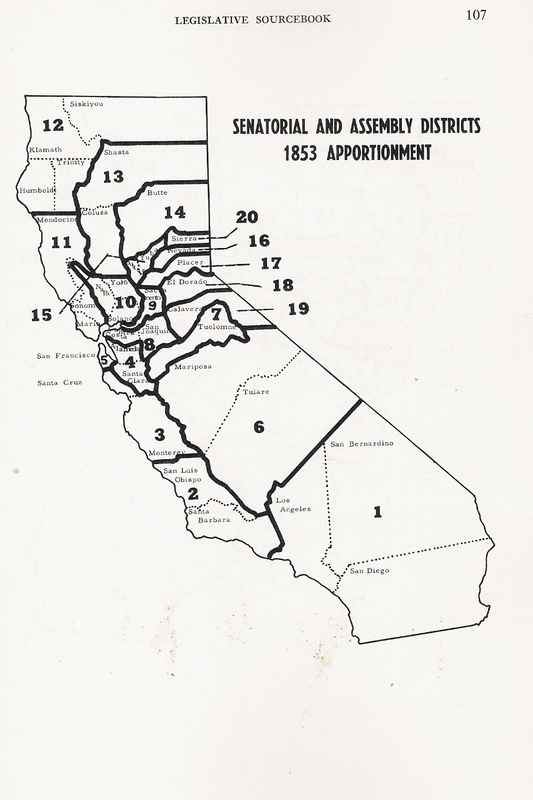 NOTE: The Apportionment of 1883 was the first that provided for unique districts for members of the Assembly. 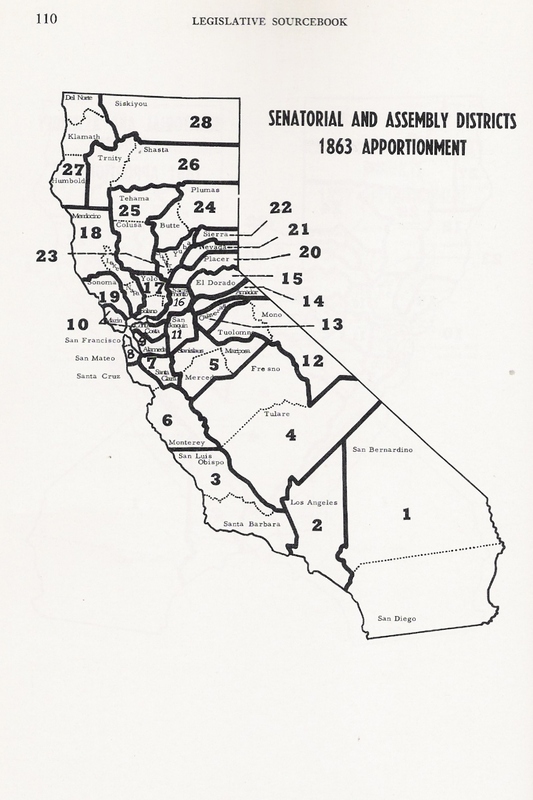 From 1849-1883, Assemblymembers were elected from Senate Districts. 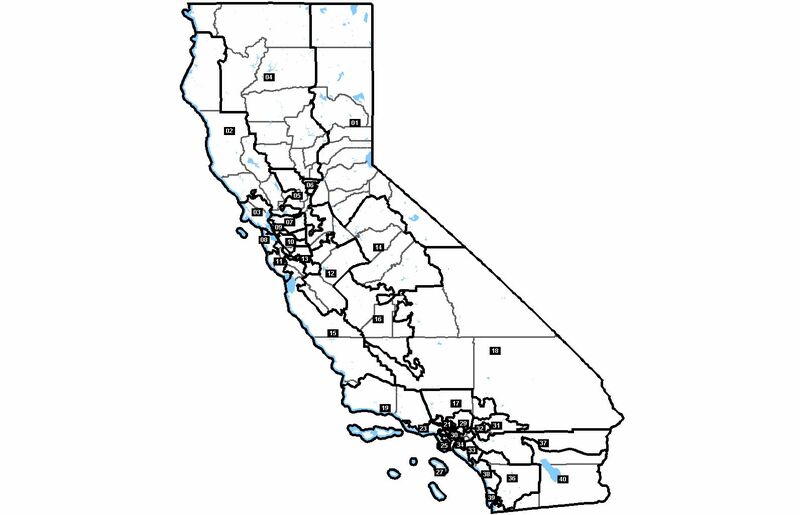 For uniformity and simplicity, this website converted those districts to Assembly Districts (the Assemblymen from AD-03 were actually the Assemblymen from SD-03), which is also why multiple Assemblymembers could be elected from a single "Assembly District". 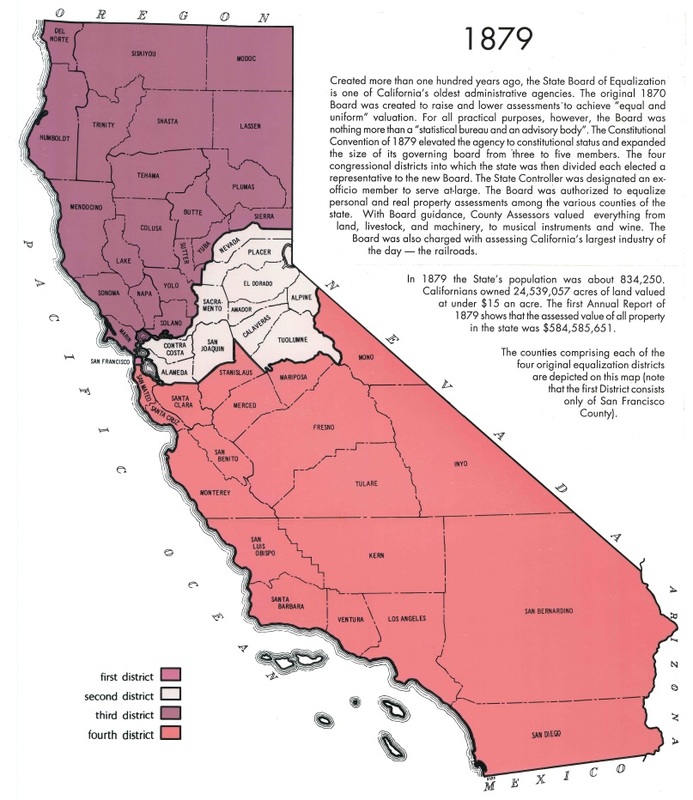 The State Board of Equalization was created by the State Constitution of 1879. 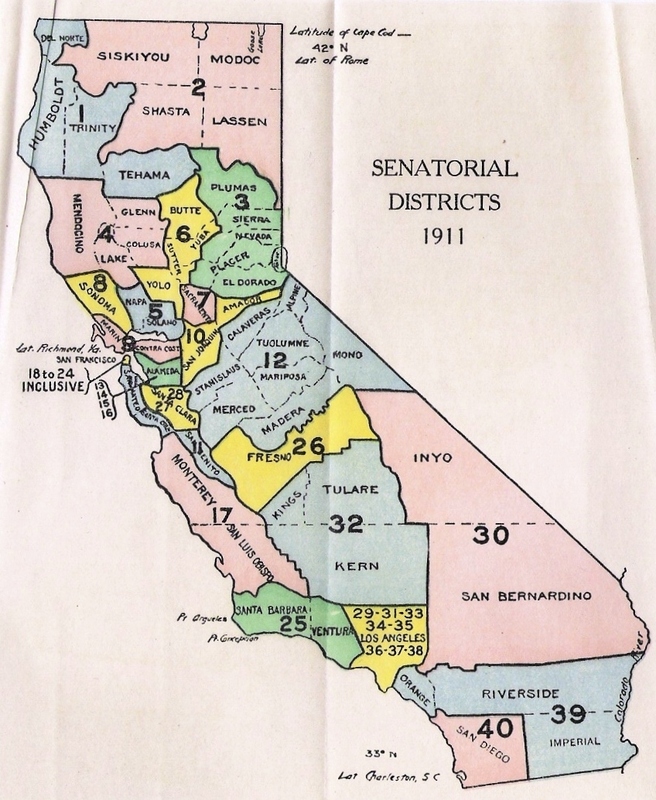 Note: The number of Senators rose to 40. 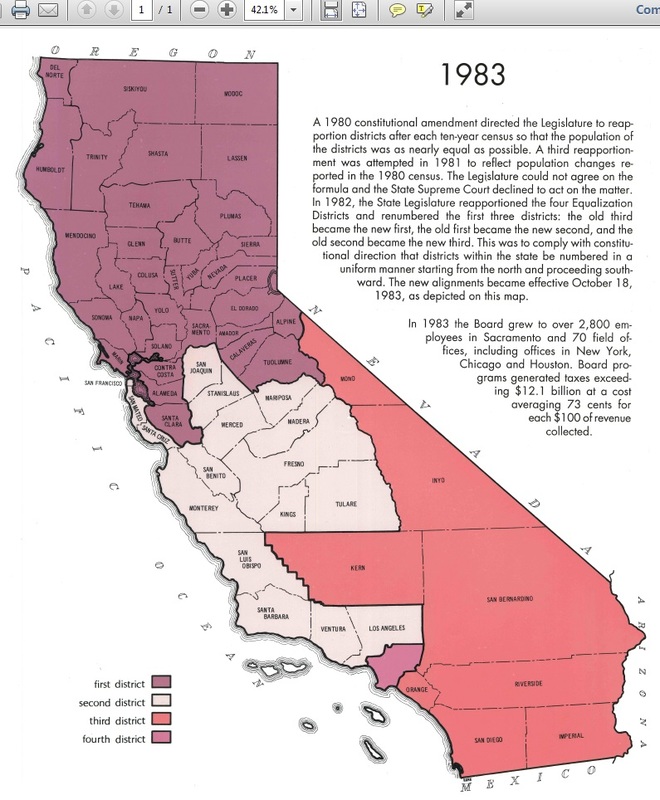 The Legislature passed a law in 1857 (Chapt. 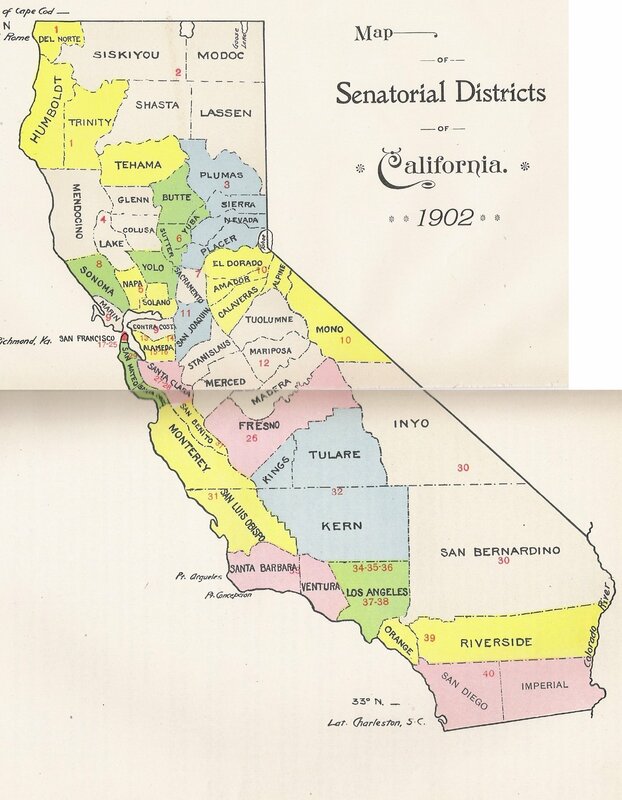 155, Acts of 1857) allowing a second Senator to be elected from the 14th Senate District. 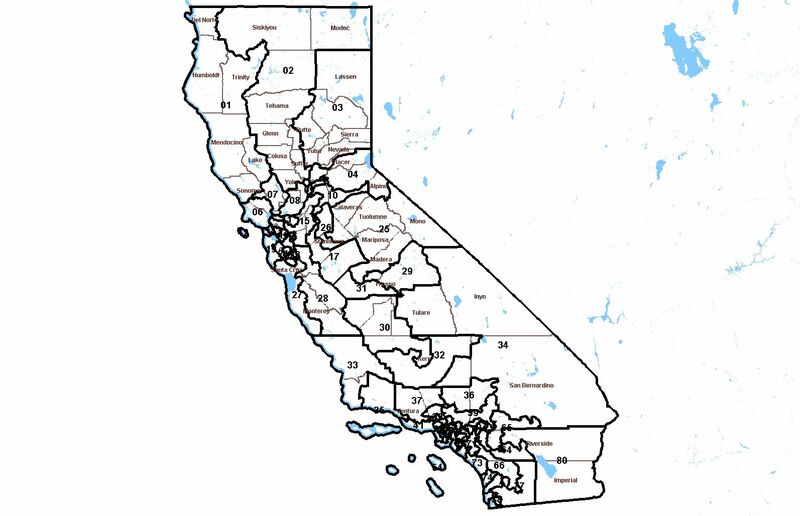 No district lines changed. 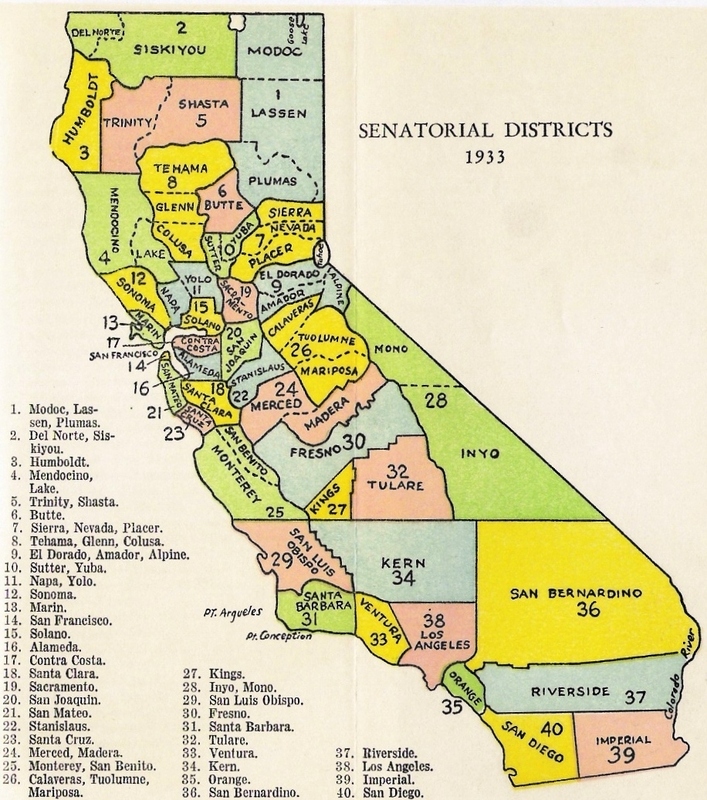 Note: The number of Legislators increased to 34 Senators and 80 Assemblymembers. 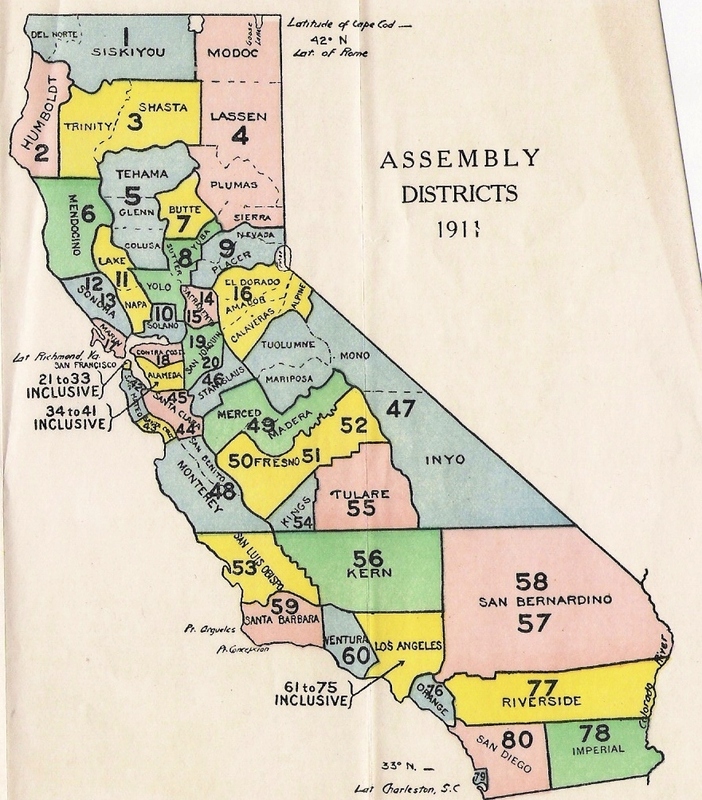 Note: The number of Legislators increased to 26 Senators and 63 Assemblymembers. 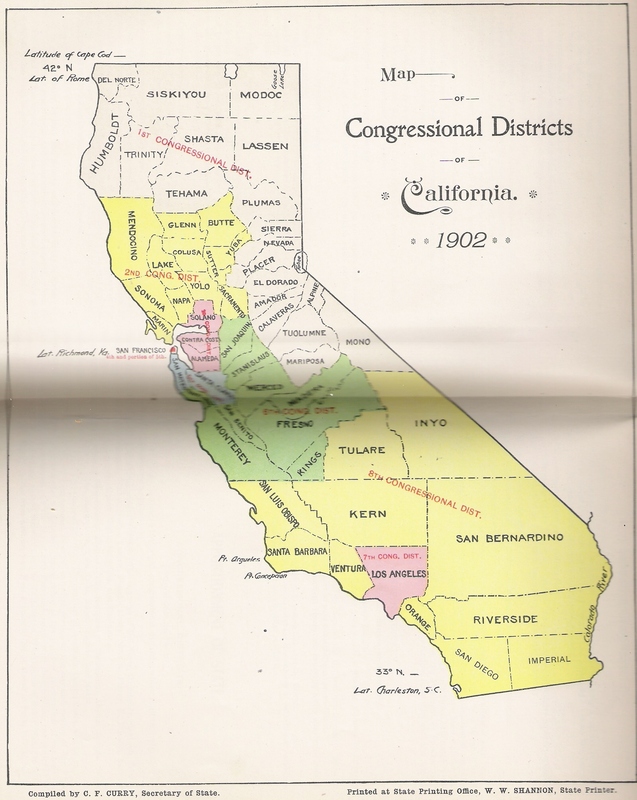 Note: In 1853, one seat in the Senate was permanently removed from SD-15 and placed in SD-06. 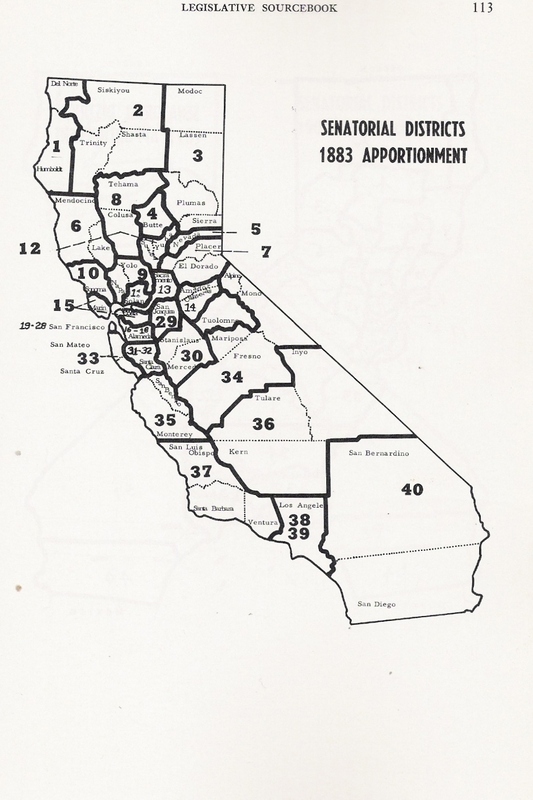 Note: In 1853, an additional Senate seat was temporarily given to Butte and Shasta Counties. 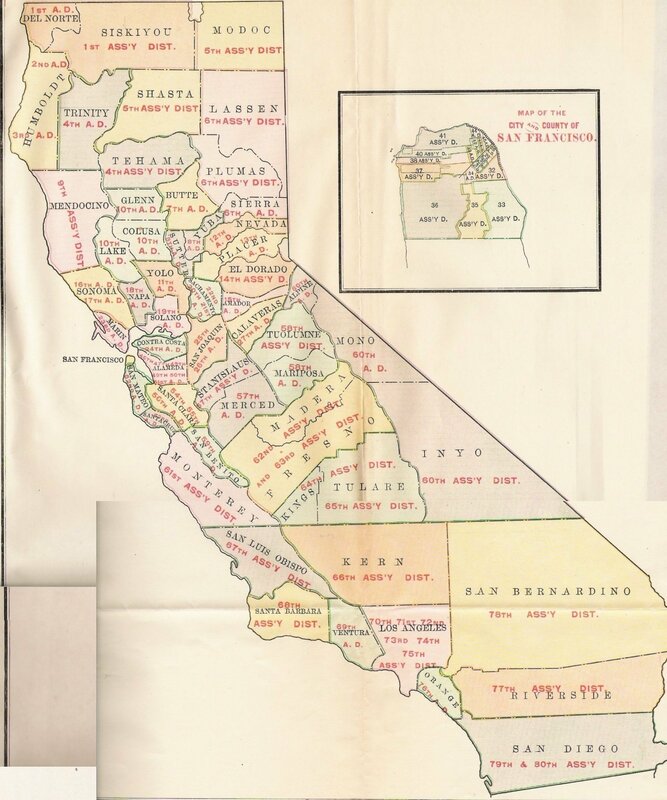 This seat disappeared in 1856.